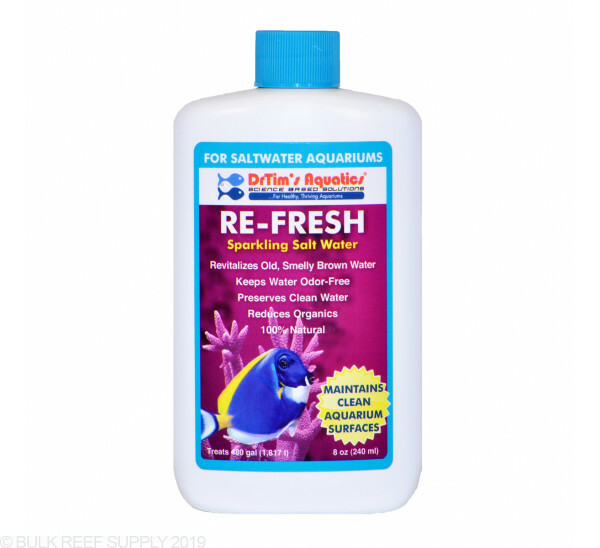 Keep your tanks water crystal clear with Dr.Tim's Re-Fresh! Specially selected, beneficial bacteria that work in harmony to combat water discoloration and odors. There are many uses for Re-Fresh, if you are starting a new tank or if your aquarium naturally has discolored water Dr.Tim's potent combination of bacteria can help. The liquid additive revitalizes green or brown tank water, and also help maintain overall water and surface cleanliness. Another benefit of Re-Fresh is that it will help reduce tank odors, especially in new tanks while reducing organics. Shake well before using, and add 5mL per 10 gallons of aquarium water once per week. Since every reef tank is different it may be necessary to add Re-Fresh more often to achieve desired results. For the best results use with Dr.Tim's Waste-Away. Caution: Re-Fresh may be harmful to snails and shrimp. Do not overdose on tanks containing these organisms. Wait for 5 to 7 days after final dosing to add these organisms.